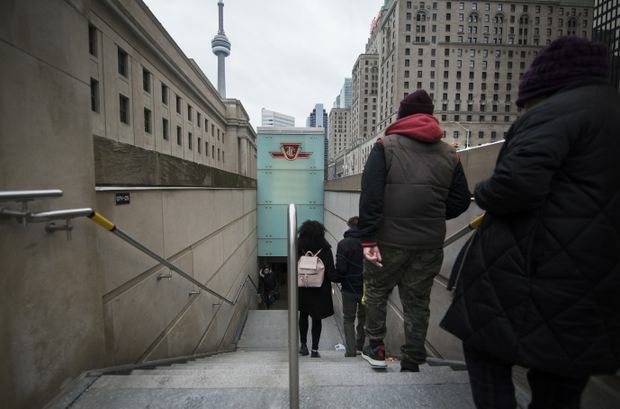 Passengers head down the stairs to the TTC subway system at Union Station on Jan. 3, 2019. It’s going to cost about $33-billion in capital expenditures to keep the current transit network going in Toronto over the next decade and a half, according to a forthcoming report, a new sum that raises the stakes in the current discussion about the province taking over the city’s subways. The report is expected to be released Friday by the Toronto Transit Commission as part of the agenda for its monthly meeting next week. The tally includes the cost of reconfiguring the heavily used Bloor-Yonge subway interchange, buying vehicles, modernizing the signal system and a host of other things the agency has long said are necessary. This sort of accounting is unusual for the TTC, which has traditionally crafted capital estimates that push some items “below the line” and into an unspecified future. “We asked for an exhaustive review and they started that work and they said ‘it’s big, it’s really big,’ ” said Councillor Shelley Carroll, who sits on both the TTC board and the city’s budget committee. The estimate also offers a hint of the scale of financial burden the province could be assuming if it proceeds with its plans to upload the subway network. When the Progressive Conservative party discussed this idea during the campaign, they suggested that taking over the subway would mean them paying about $160-million in annual capital costs. It is not publicly known how the TTC’s $33-billion breaks down between surface and underground transit. However, the subway has traditionally generated the bulk of unfunded budget demands. If even half the total is for the subway, that would far surpass the province’s expectations. The new accounting comes as Mayor John Tory tries to get TTC board and city-council approval to speed up planning for a long-planned subway into the city’s downtown. Under the accelerated approach, which was devised by staff at the TTC, the project could be finished within a decade, two years sooner than previously expected. This would require spending an extra $325-million over the next two years. But this is money that would have been spent later anyway, according to the head of the project, meaning the overall cost shouldn’t change. The relief line is tentatively budgeted at $6.8-billion and is not funded. It would run south from Pape station, on the Bloor-Danforth line, and then curl west to enter the downtown under Queen Street. It would finish at University Avenue, intersecting with the existing subway network at Osgoode station. This would take pressure off the Bloor-Yonge subway interchange by diverting some passengers onto the new line. TTC chair Jaye Robinson explained that the plan to accelerate work involves building some aspects of it at the same time, instead of in sequence. These include property acquisition, utility relocation, and preparatory work related to tunnel boring. The idea resembles one put forward by former chief planner Jennifer Keesmaat, who was Mr. Tory’s main opponent in the campaign for mayor and who said that work on the project could be accelerated. At the time Mr. Tory said that he had been told the work was being done as quickly as possible. On Thursday, the mayor said the idea for how to speed up the project came from the TTC. “I am committed to being the mayor that gets the relief line built,” Mr. Tory told reporters as he announced the plan. The TTC has projected that crowding on the Yonge subway will reach unacceptable and dangerous levels during rush hour by 2031, which has long been the target for finishing the relief line.